Unidentified original owner; his arms (azure, three bars argent) supported by two putti on 1; unidentified later owner; his arms (per fesse, the base per pale, in chief azure, three fleurs-de-lys or above three torteaux, the dexter base chequy gules and argent, the sinister base azure, a stag rampant argent) on fol. 98r; Augustus Frederick, Duke of Sussex; Henry Drummond; G.H. Last, London; Walter Wilson Greg; James P.R. Lyell; purchased by Curt F. Bühler in Nov. 1954 from Bernard Quaritch, London (Cat. 731, no. 186). 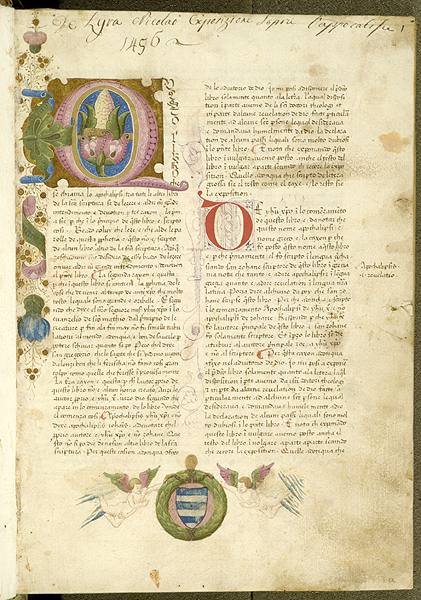 Ms. written and illuminated in Urbino, Italy, and dated Oct. 8, 1456. Decoration: 1 pencil drawing, 1 decorated border with putti supporting armorials, 5 illuminated initials, 21 unfinished initials drawn in pencil. The illumination of B.20 is unfinished. 21 initials were drawn in pencil but not painted. The text is a compilation by Fredericus de Venetiis based largely on the work of Nicholas de Lyra; after the colophon are religious poems written in the same hand as the manuscript; one leaf is missing, but some 400 lines remain--Cf. PML files.